Yaganti has many places of historic importance apart from the Uma Maheswara Swamy Temple. There are several caves in the hills surrounding and one of them is Veera Brahmam Cave. To reach the cave, one has to climb a series of steep steps that are not too steep. Once one reach the top to enter inside one has to bend half over. 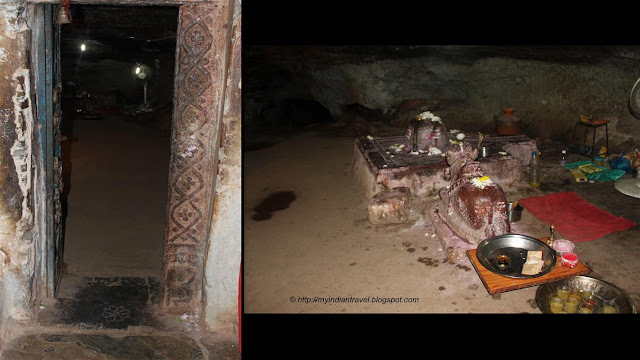 Inside the cave there is small Shiva Linga and Nandi in front of it. This is the cave where saint Sri Potuluri Veera Brahmendra swamy wrote some of his Kala Gnaanam (prophecy). Wonderful. Thanks for all pics. What an fascinating place to visit, imagine building such a grand entrance to a cave! Thanks for taking the MM crowd along on your trip this week. Looks a fun cave to explore, especially if you are a little one! Those steps seem pretty steep, and narrow, to me! Lovely hideaway spots and great job lighting up the cave. Too many steps for me I'm afraid, thanks for sharing. Last weekend only visited this place. I know i would be out of breath walking up all those steps but i would still want to see inside. neat. the steps do look steep. In Malaysia, they have a famous Batu Cave shrine. Very interesting to see this cave and imagine the poet/philosopher writing alone in this quiet place -- I can imagine meditating there, but think it would be hard to write. Thank you for taking us into what seems like a hidden treasure! I would have a hard time climbing that stairway. Although I think I would give it a go just to be in this quite spot. Perhaps the poet had a candle to write by...otherwise it might have been to dark to write in that cave. You really do find interesting sights to visit. Your family is learning a lot of history. Thank you!